Yesterday was a very special day... the day when New Zealand and Australia remember and honour members of the Australian and New Zealand Army Corps who fought at Gallipoli during World War I (plus others are honoured too who have died and served in military ops for our country since). What a great day to make ANZAC biscuits... I love how food can be a great way to remember special occasions and memories. As we talked about ANZAC day around the table, one of the boys proudly told us what 'ANZAC' stood for... Australia and New Zealand Army Choir! Ha. 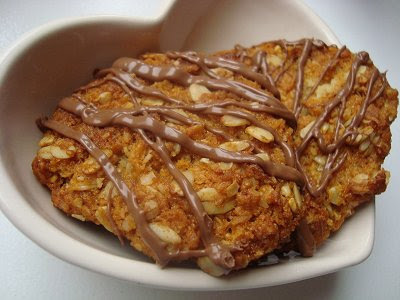 ANZAC biscuits are pretty simple, so I love to add extras like chocolate chips, sliced almonds or drizzle melted chocolate over the finished product. Mix together flour, sugar, coconut and rolled oats. Melt butter and golden syrup. Dissolve baking soda in the boiling water and add to butter and golden syrup. Stir butter mixture into the dry ingredients. Place level tablespoonfuls of mixture onto cold greased trays. Bake at 180 deg C for about 15 minutes or until golden. Yummy! I thought about making anzac slice but didn't get around to it, thsoe look yummy though! The chocolate drizzle is a winner! ewwww; i fell in love with these when i was in school in australia. they made me fat but i love unconditionally.